736 So. Shore E. Caroga Lk. Rd. 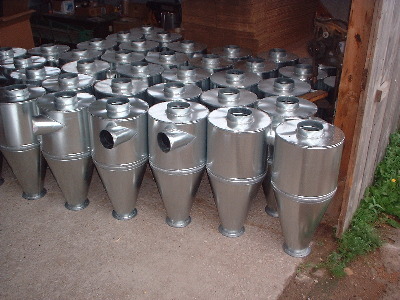 These cyclones are for use with woodworking dust collectors and large shop vacuums. They are designed for small commercial shops or the home woodworking hobbyist. Placed between a dust collector and woodworking piece of machinery they will separate out sawdust down to very fine particles. I have incorporated into these units inlet and outlet sizes which are compatible with dust collectors. This means you can use existing stovepipe fittings for piping between the cyclone and dust collector which are available at your local hardware store. The cyclones all have the following in common. They all are made of G90, 24 ga galvanized steel and have 1/8" thick flanges on the bottom for mounting. They use the Pittsburgh lock procedure for seams and some seams are also soldered. All cyclones, except the shop vac cyclone, use a neutral vane and the inlet tube is sloped down 15 degrees for more efficiency. These cyclones can be mounted on a variety of vessels, like: galvanized trash cans, fibre barrels and wooden boxes. It is important to make sure the container is airtight for the system to work properly. I have customers that are also using these for overspray from powder coating, bead blasting collection and sand blasting cabinets. Most recently I have sold my shop vac cyclone and the medium size cyclones around the world for coffee roasters with great results. Additional information will also be given on each products page.